The liquid crystal (LC) originally filled in thin cells is replaced by a different LC having a drastically different pretilt angle. The mechanism of desorption/adsorption of LC molecules from/on the adsorbed LC film at the substrate changes the composition of the adsorbed layer and thus the pretilt angle. 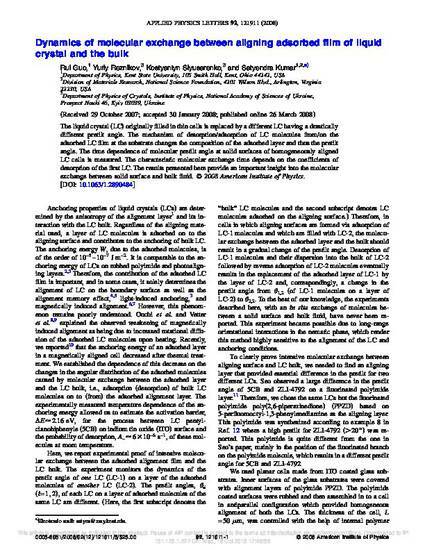 The time dependence of molecular pretilt angle at solid surfaces of homogeneously aligned LC cells is measured. The characteristic molecular exchange time depends on the coefficients of desorption of the first LC. The results presented here provide an important insight into the molecular exchange between solid surface and bulk fluid. (C) 2008 American Institute of Physics. Copyright 2008 American Institute of Physics. This article may be downloaded for personal use only. Any other use requires prior permission of the author and the American Institute of Physics. The following article appeared in Appl. Phys. Lett. 92, 121911 (2008) and may be found at http://dx.doi.org/10.1063/1.2890484.